This weekend, my roommate and I went to what I’ve been referring to as a food festival. It was called Taste of the Summit. Despite the fact it felt like a thousand degrees out there, we had a blast. We got to try a lot of different restaurants from the area. I think the idea was to showcase a lot of the new restaurants. Most I had never tried before. Zoes Kitchen was one of my favorites. The first restaurant we tried was Zoes Kitchen. This was definitely one of my favorites. 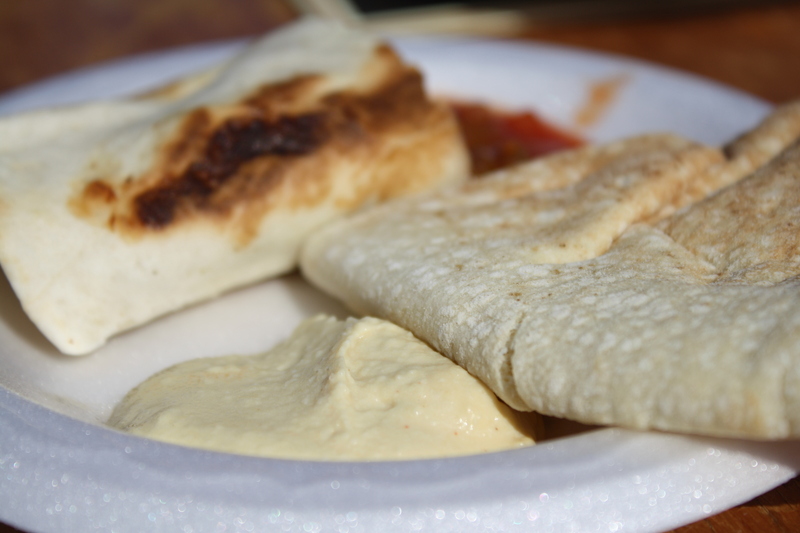 They served samples of chicken rollups with salsa and pita with hummus. I swear, that was some of the best hummus I have ever tasted! Amazing. Village Tavern served chicken with penne. Our next stop was Village Tavern. 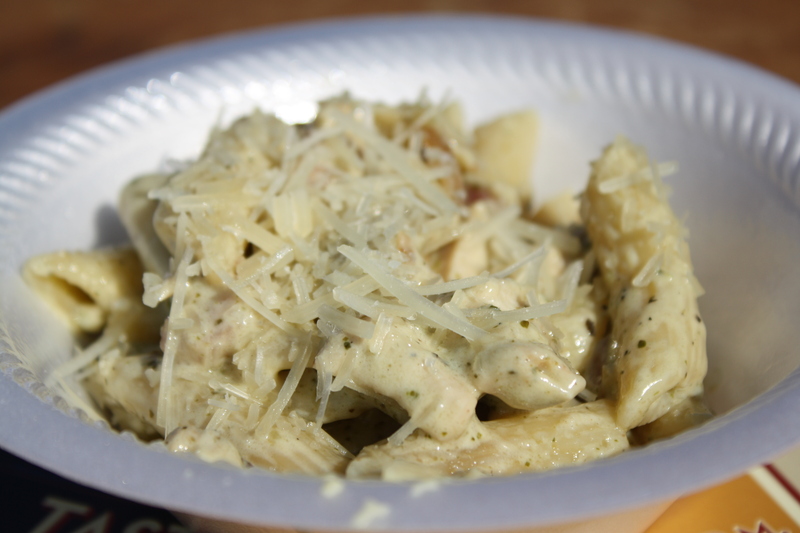 They served wood grilled chicken with penne, crispy pancetta, caramelized Bermuda onions and basil cream sauce. It was good, but too heavy for the hot weather. Macaroni Grill served Pasta Milano. Macaroni Grill gave us the option between two different pasta dishes: Pasta Milano and Penne Rustica. We chose Pasta Milano. 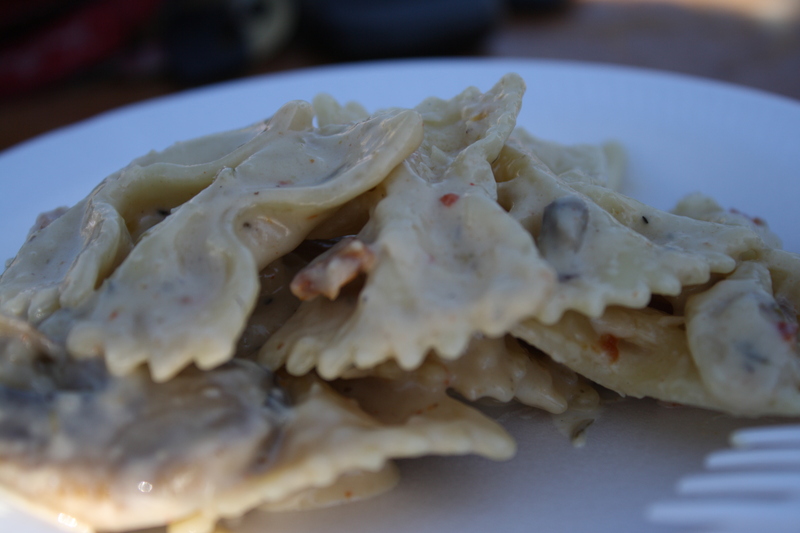 It had mushrooms, which I love, so it was a no-brainer for me. I’m not really sure why my roommate chose it; she hates mushrooms. 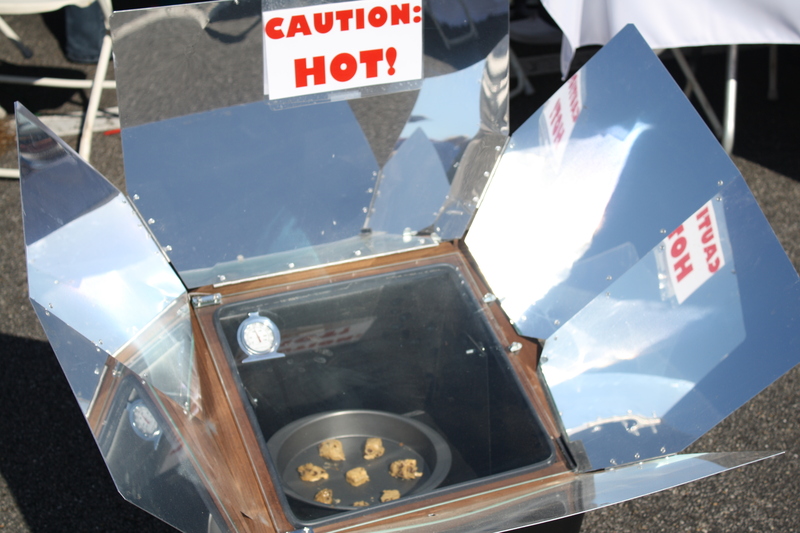 Some people were baking cookies in an awesome sun oven. We took a break from the heat after awhile. We bought some water and ventured into Old Navy for some shade. On our way there, we saw an awesome sun oven. Some people were baking cookies in it. It had reached about 250 degrees Fahrenheit by the time we got there. So. Cool. 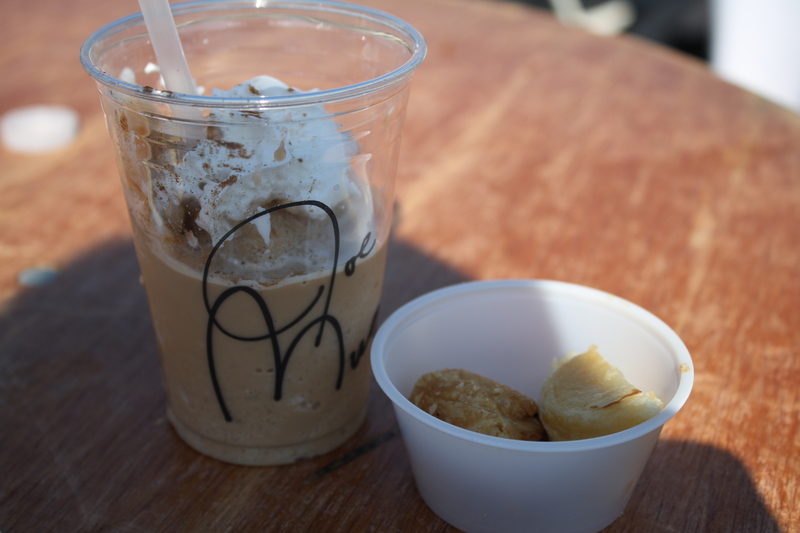 Joe Muggs had incredible treats. After our break, we hit up Joe Muggs. It was so good! It served Brie en Croute with Orange Marmalade; Onion Tartlet with Parmesan, Fontina, and Egg; and Pumpkin Spice Frappe. My roommate has been craving pumpkin-flavored things for about a month, so she was super excited. 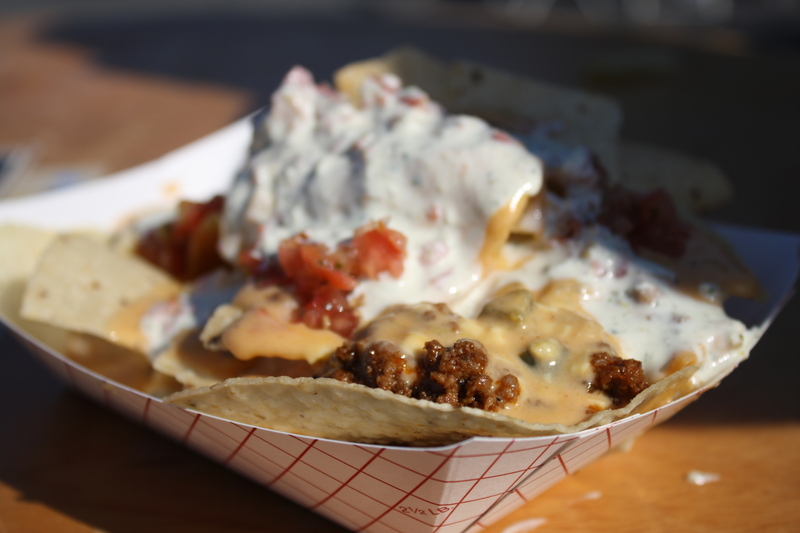 Chuy's Mexican Food served some amazing nachos. We had been checking out Chuy’s Mexican Restaurant the whole time we were at Taste of the Summit, so we were pretty stoked when there was a short line. The nachos were fabulous! They gave us a lot of chips for the nachos, so I split them with my roomie. My roommate tried the fried pickles from Sweet Bones Alabama. 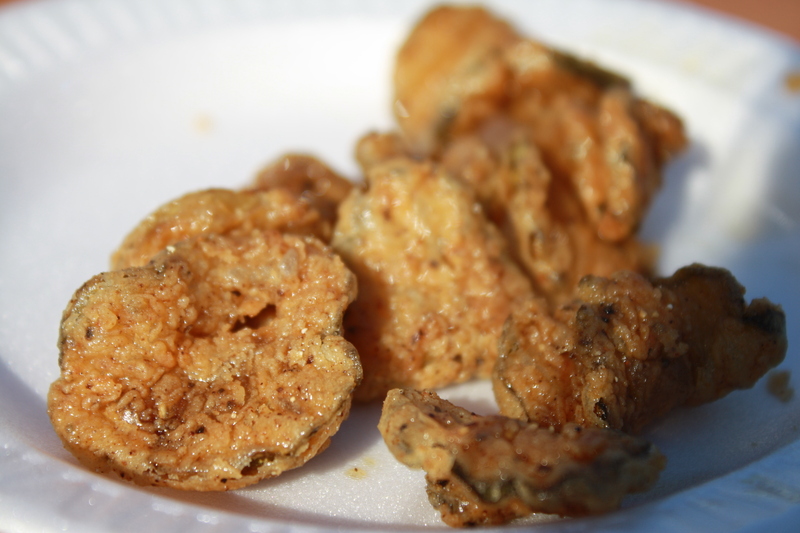 Sweet Bones Alabama served fried dill pickles. My roommate tried them, but she said they were too greasy and heavy for the 90+ degree weather. The menu said Sweet Bones Alabama also served Cajun shrimp and grits, but they were gone by the time we got to their tent. 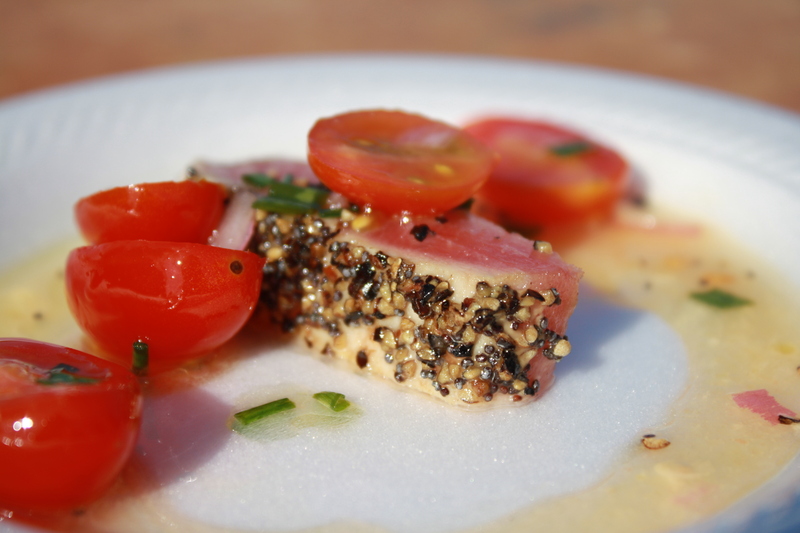 Fleming's Steakhouse served some very tasty Seared Ahi Tuna (aka Tuna Mignon). I was a little afraid to try what Fleming’s Steakhouse referred to as “Tuna Mignon.” I’m so glad I tried it! It was one of the most incredible things I’ve tried. I don’t think I can describe this any other way than wow. It was just amazing. My roommate said this was the best burger she's ever tasted. 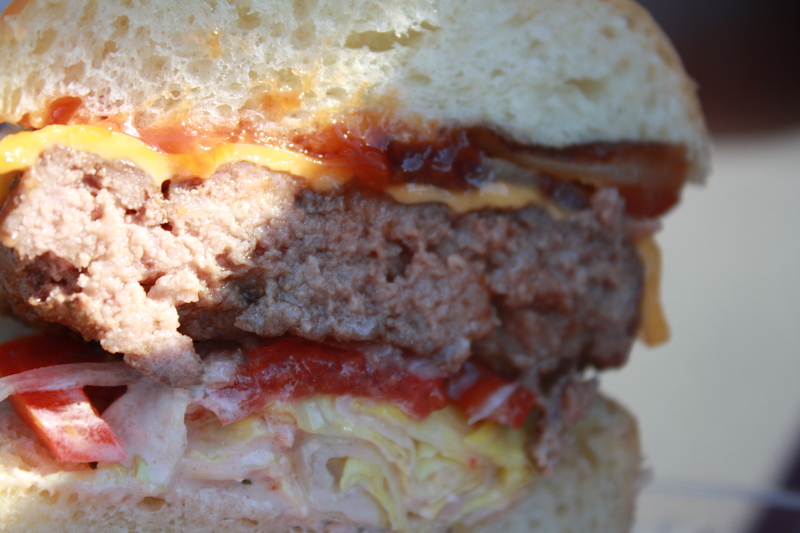 Flip Burger Boutique served–what else?–burgers. I don’t eat red meat, and that’s all they had on hand, so I didn’t try it. But my roommate said they were incredibly good. This is how the burger was served. 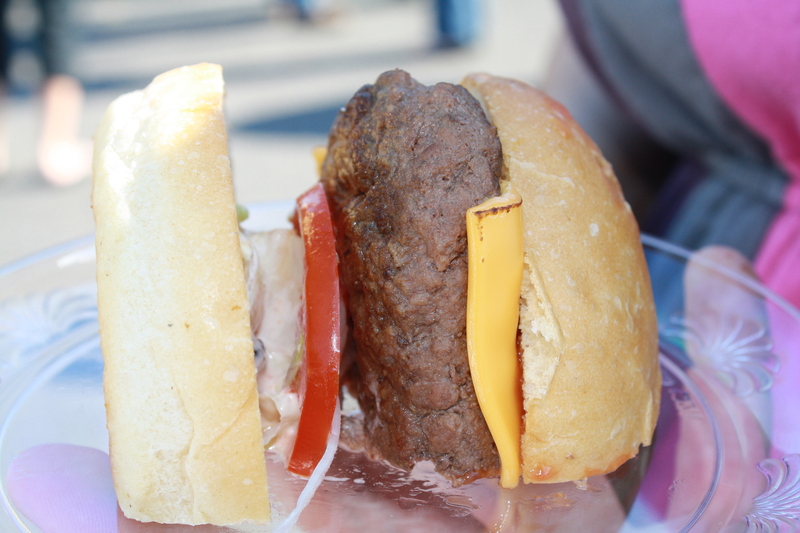 We looked at the menu online and saw that they serve a variety of other burgers, including turkey, veggie, and tuna. It all sounds so good! We have plans to go sometime soon. I had the strawberry yogurt; it was yummy! 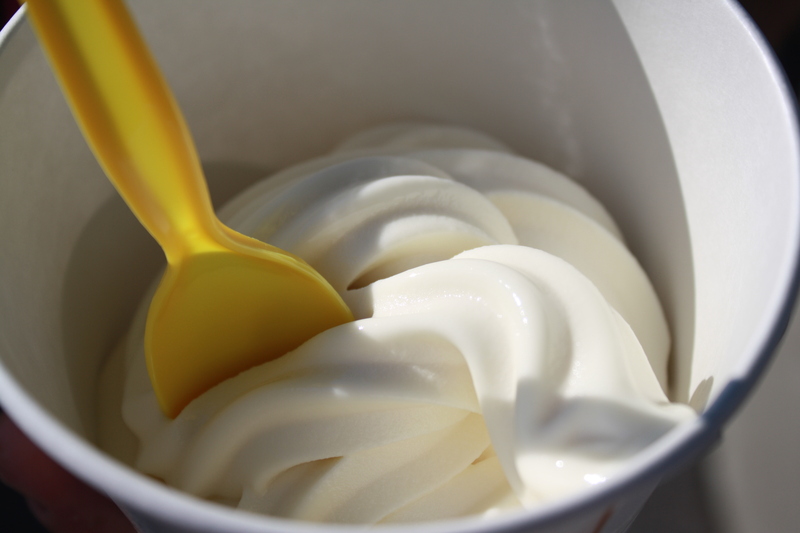 Our final stop was 32 Degrees Yogurt Bar. I love frozen yogurt, so I was uber excited to try whatever they were serving. I had the strawberry yogurt. I swear it tasted like real strawberries! My roommate tried the Tahitian Vanilla yogurt. My roommate said the Tahitian Vanilla yogurt was really good. But, what can I say? 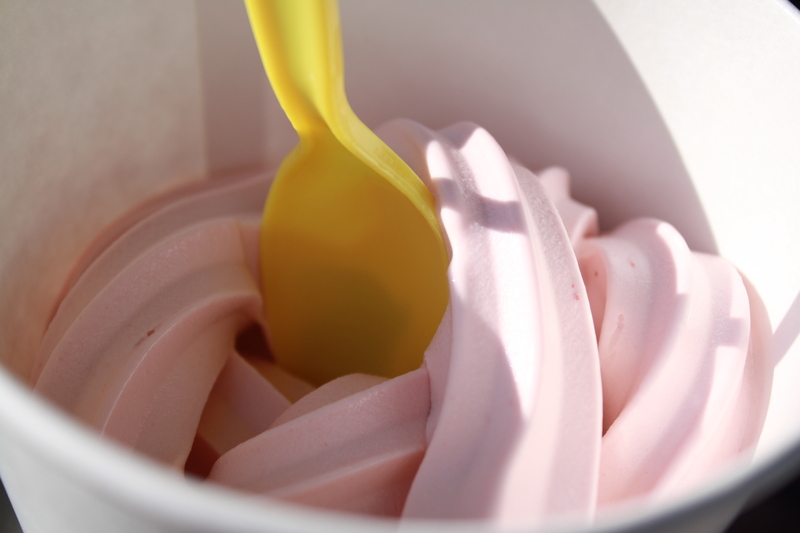 We love, love, love frozen yogurt! This entry was posted in Uncategorized and tagged dessert, facebook, food, food festival, fried, frozen yogurt, fun, heavy, hummus, mushroom, onion, pasta, pita, restaurants, taste of the summit, tomato, twitter, yummy. Bookmark the permalink.